Becky Weyrauch leads battling ropes at Rock Your Fitness. We’re a month into 2016. How are those New Year’s resolutions holding up? According to Nielsen, the consumer insight source, “Staying Fit and Healthy” and “Losing Weight” are the top two resolutions to be made and broken. After the holiday revelry, we all resolve to eat better, exercise, lose a few pounds, etc. How about making 2016 the year you achieve your fitness and health goals? One way to ensure success is to make them reasonable and attainable. A goal of “losing weight” is too open-ended, but if you decided that losing five pounds the first month was your goal, you would have an easier time reaching your goal. Another way to ensure your success is to not go it alone. It’s easy to get pulled away with family or work obligations and not workout. Especially when the daylight hours are so short. Accountability to someone at the start of a fitness regimen is the key to meeting your goals. The social aspects of gyms and classes will motivate you during your workout, and help keep you coming back. If you’re not the resolution making type like me, you can still change things up from your normal routine. Eliminate the following from your vocabulary: I’m not fit enough (to try spinning if you’re a runner); it’s scary (to try TRX); I don’t have time (to go to yoga)… You get the idea. Now is the perfect time to try something different, because you won’t be the only one at this time of year! So now what? Join a gym or fitness studio, sign up for a boot camp or personal training sessions, or join a yoga studio. Many of these options will have introductory offers or a complimentary personal training session for new members. In the Greater Capital Region, there are nearly two dozen branches of YMCAs in multiple networks, such as the Capital District, Saratoga Regional and Glens Falls Family, to name a few. 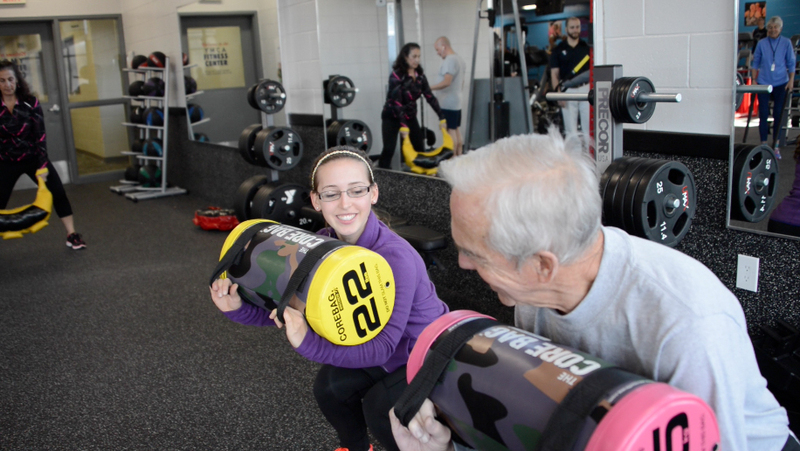 Membership to the Y offers fitness and community for individuals and families. Most facilities include free group fitness classes, yoga and Pilates, free-weights, cycling classes, and cardio equipment such as treadmills, bikes, and ellipticals or stair climbers. Many Ys and health clubs offer the SilverSneakers fitness program, a proven, results-oriented program for all levels and abilities of older adults. It generally improves overall well-being, strength and social aspects, and is provided by health plans at no additional cost. SilverSneakers includes kettlebell, boxing, an array of swimming and water aerobics classes, and much more. YMCA memberships include child care, nutrition and wellness professionals, and locker rooms and showers, so there are no excuses to be made! Check out cdymca.org, srymca.org or glensfallsymca.org. If a full service health club is not what you’re looking for, a great option for you may be a fitness studio or boot camp workout. These cardiovascular and strength training workouts offer variety, motivation, and calorie and fat burning exercises that can supplement other sports you do. Rock Your Fitness in Malta is one such example of a terrific “total body training.” Instructor and owner, Becky Weyrauch, incorporates kettlebells, medicine balls, TRX, battling ropes and more, alongside classic push-ups, jump ropes, running, squats and lunges for a unique, fun and sweaty workout in every class. For newbies or anyone who’s nursing an injury, there’s always a modification provided for each exercise. Athletes of all ages, abilities and interests can build strength, use different muscle groups, and have fun while working out to music. As a longtime boot camper, this cross-training class has happily kept me coming back, and to help me stay injury free while running 10 to 20 miles weekly. Sessions are six weeks long, with options to join one, two or three times a week. Learn more at rockyourfitnessny.com. Yoga studios are very popular in our region. Look in a shopping plaza and you may see a yoga studio, which makes the practice so much more accessible than ever before. Yoga is a physical, mental, and spiritual practice or discipline that originated in India. The most well-known types of yoga are hatha and vinyasa yoga, however there are different varieties of schools, practices and goals in yoga – including ‘yoga for athletes,’ so you can find one or more to suit your health and fitness needs. Yoga Mandali in Saratoga Springs, as with many other studios, has a yoga practice on the schedule that will suit all levels. The expertise of a trained yoga instructor can also help improve the physical and mental aspects of running, bicycling or any sport you do. You’ll often find a schedule of yoga classes at the YMCAs and most gyms. Socializing with the fitness crew is a lot of fun. Anyone who has experienced the social aspect of training together, working toward conquering difficult physical feats and challenging oneself, understands that this fosters a community spirit. Work hard and play harder. It’s only February so use this New Year as an incentive, and commit to improving your health – and reaching your health, fitness, event or race goals!